Media captionPlayers knock a heavy solid rubber ball up and down a narrow pitch. 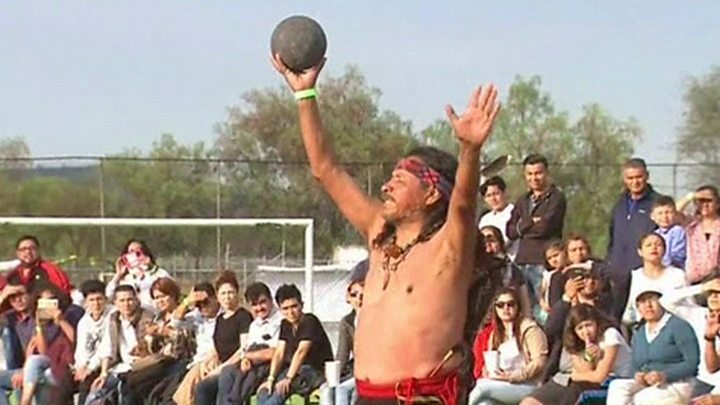 Organisers have been trying to bring back the game, known as Ullamaliztli in Mexico, because of its ancient cultural and religious significance. The game was played in Central America and parts of North America before being banned by the Spanish conquistadors. The tournament, only the second since 2006, is being played by ten teams from across Mexico. According to ancient texts the ball game was seen as a struggle between light and darkness and provided the energy to keep humanity going. Today the game is played by teams of seven players, who knock a heavy solid rubber ball up and down a narrow pitch, using their hips rather than their feet. Giant ball courts can still be seen in ruins across the region. In ancient times losers of the game were often sacrificed to the Gods, but this year organisers opted for a knockout tournament instead.